Basic body: with main color , cast on 18 sts. Row 1: P across. Row 2: Knitting across, knit into front and back of first and last st of row. Repeat these 2 rows until 30 sts on needle. Continue in stockinette st.( p 1 row, k 1 row) until 4-1/2 inches from beg., ending on a p row. Row 1: K 2 tog, k across to last 2 sts, slip next st as if to k, k 1, pass slipped st over knit st.
P next row. Repeat these last 2 rows until 18 sts remain. Bind off. Make another basic body in same manner. Sew body side tog, matching at shaping, leaving bottom cast on edges open. Set aside. Feet: (make 2) with main color, cast on 11 sts. Row 1: k 5, slip next st as if to k, k 5. Row 2: P across. Repeat these 2 rows 3 more times. (8 rows). Bind off. Fold leg at slip st at center, and sew side seam. Place legs with seam side to inside, into bottom opening of body. Sew to body, then sew opening closed. Snout: With main color, cast on 4 sts. Row 1: knit into front and back of first st, k2, knit into front and back of last st..Repeat this row once. K next row. Next row: k 2 tog, k across to last 2 sts, k 2 tog.Repeat these last 2 rows until 4 sts remain. Bind off. 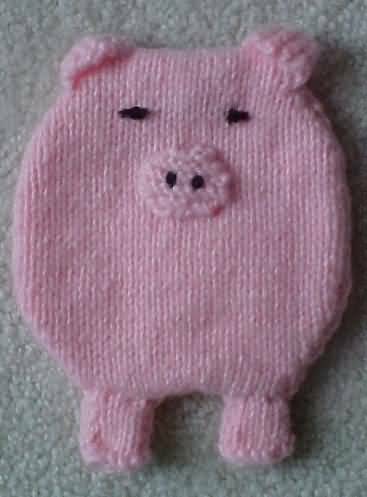 Embroider nostrils at center of snout with dark color. Ears: (make 2) With main color, cast on 3 sts. Row 2: k1, knit into front and back of next st, k 1. Row 3: k 1 knit into front and back of next 2 sts,, k 1. (6 sts) Knit next 3 rows. Ear tip: K 2 tog, k2, k 2 tog.. Knit next row. K 2 tog twice. Fasten off last 2 sts. Sew cast on edges of ears to top corners of body. Tack down ear tips. Tail: (also used as a hanger) With main color, cast on 36 sts. K 2 tog twice, bind off first st over 2nd st, k 2 tog, repeat between *'s across . Fasten off. Holding ends tog, to form circle, sew to back side of body. Embroider eyes with dark color. A novelty gift for the country folks, and pig collectors! !